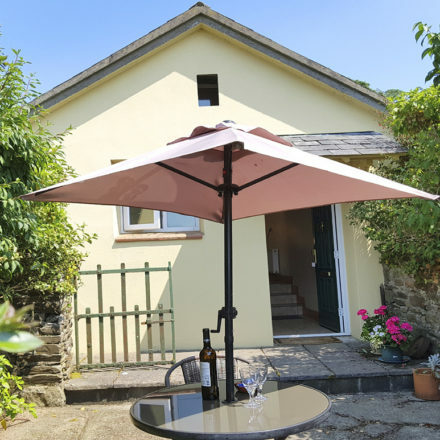 A delightful romantic cottage with charming traditional features, the Coach House provides a relaxed luxury romantic getaway for couples. 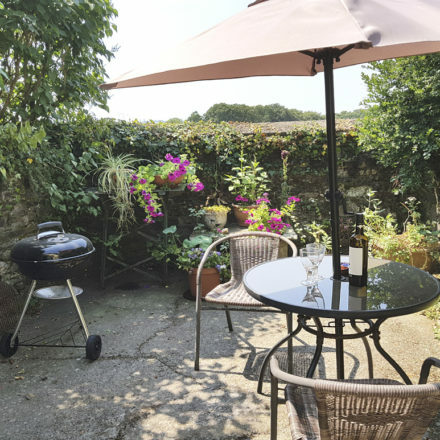 With a stylish and bright interior, bespoke bedroom furniture, attractive bathroom and full-size kitchen overlooking a charming private patio with garden furniture & BBQ is perfect to relax and observe the picturesque patchwork of fields in the surrounding countryside. 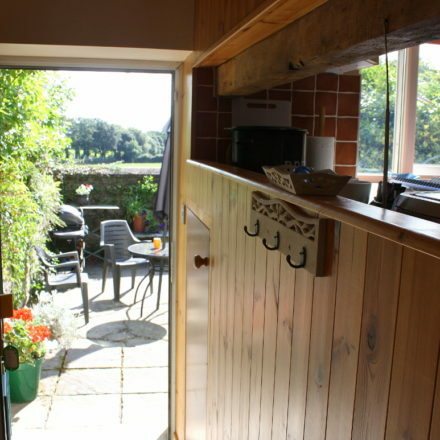 This much-loved detached cottage is a place where traditional cottage features meet modern aesthetics. 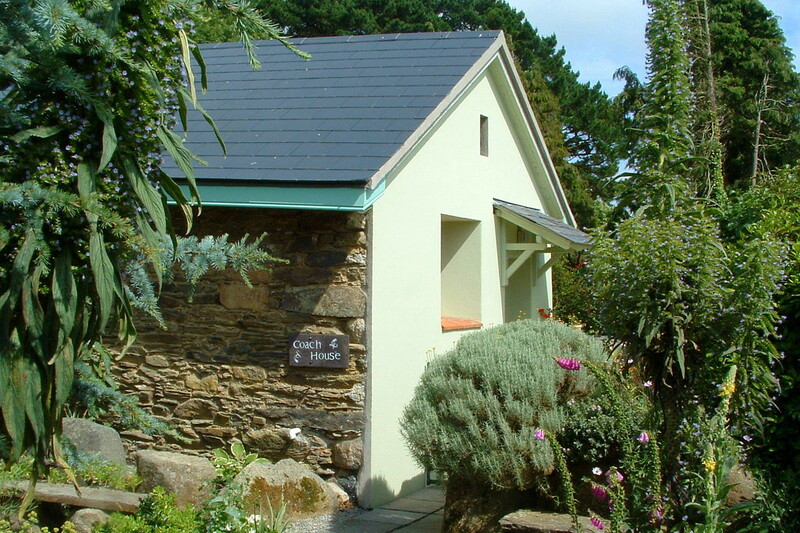 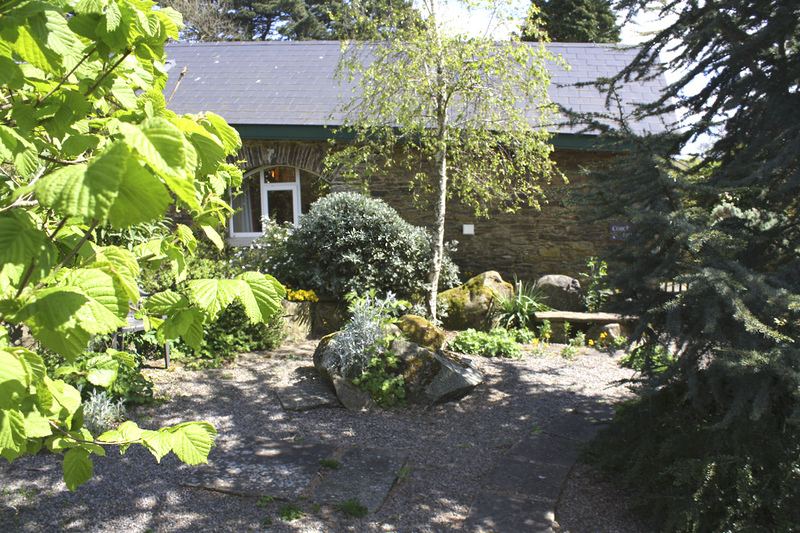 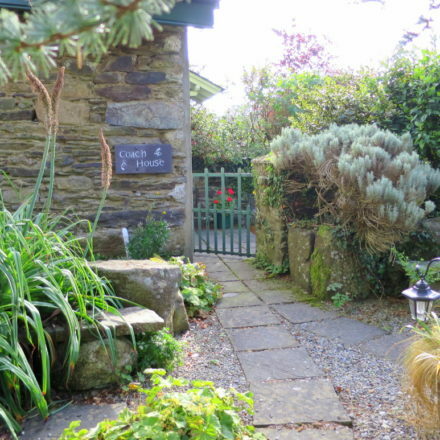 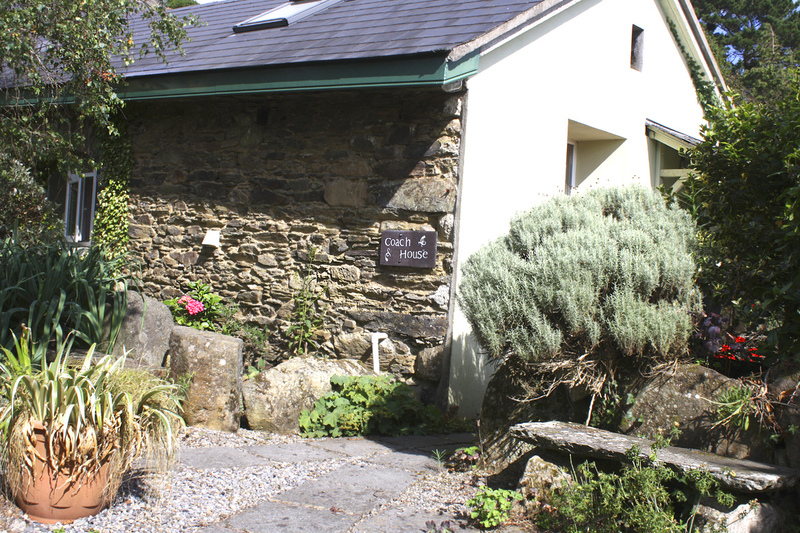 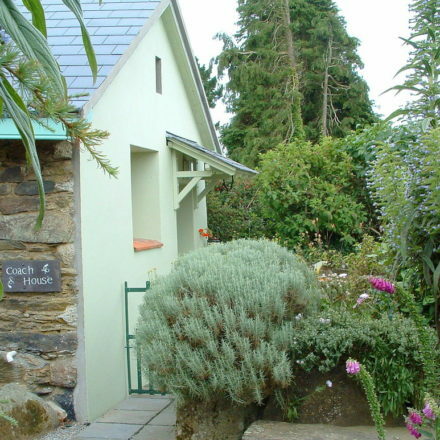 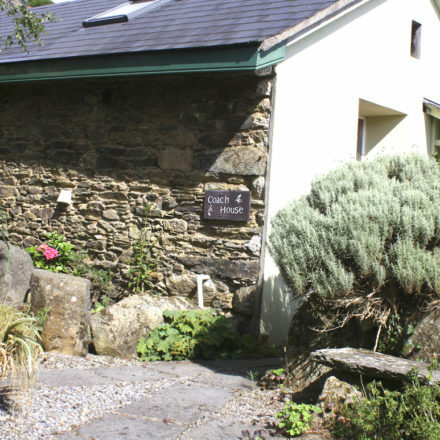 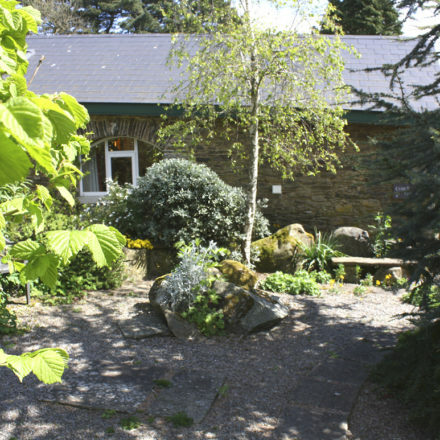 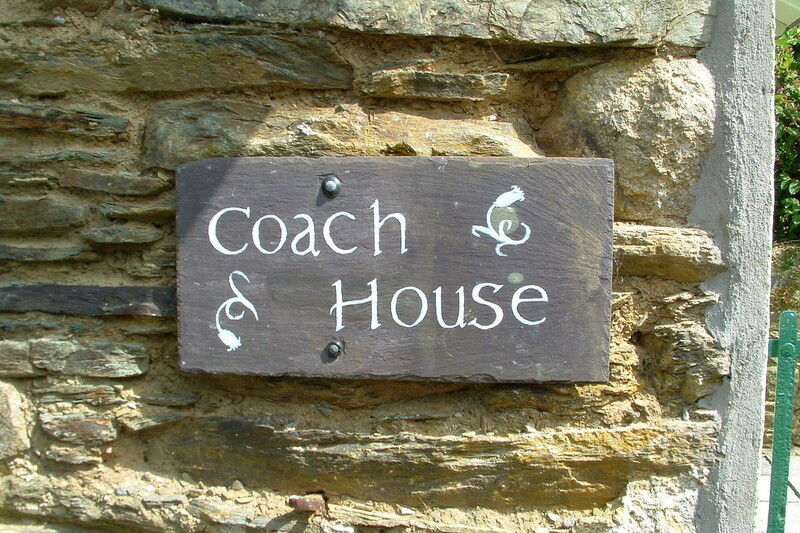 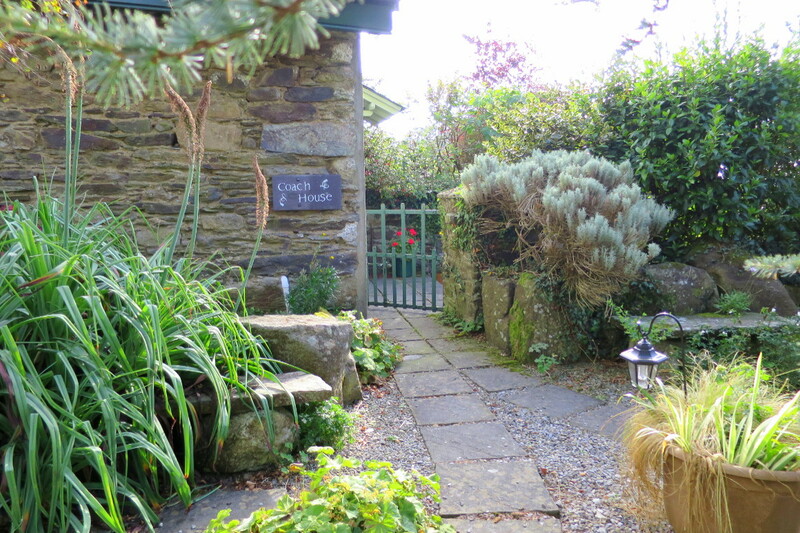 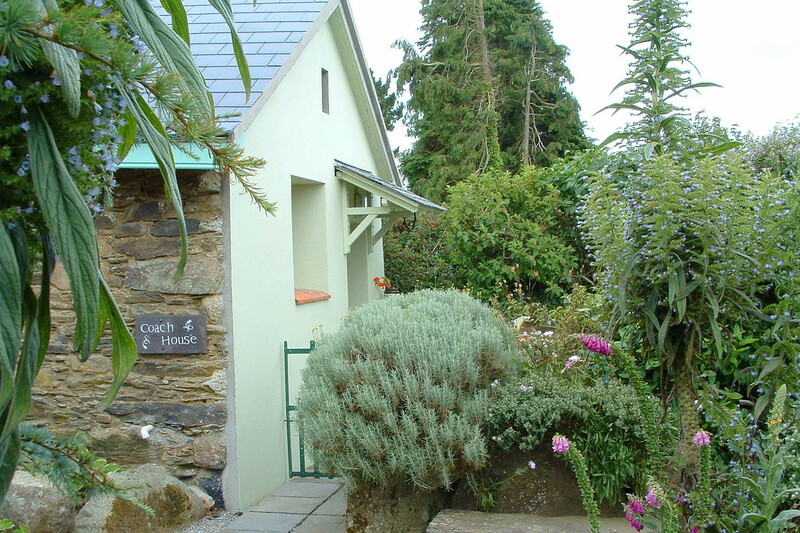 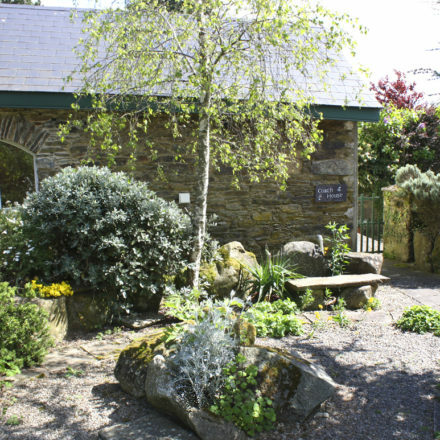 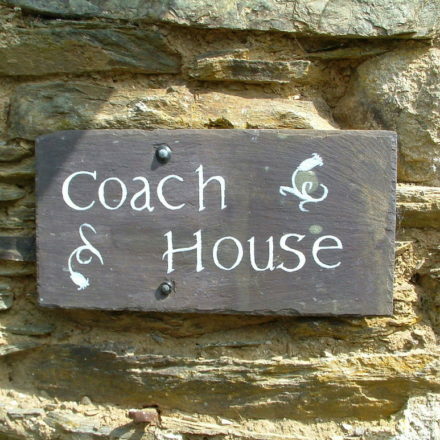 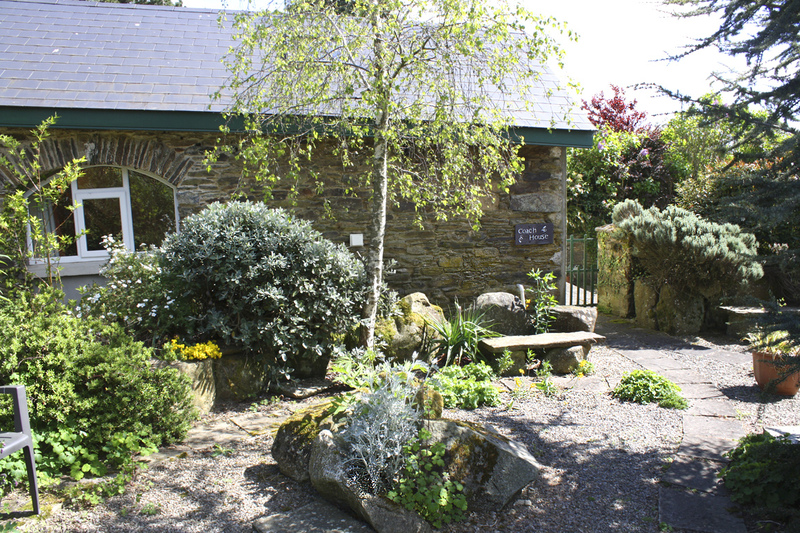 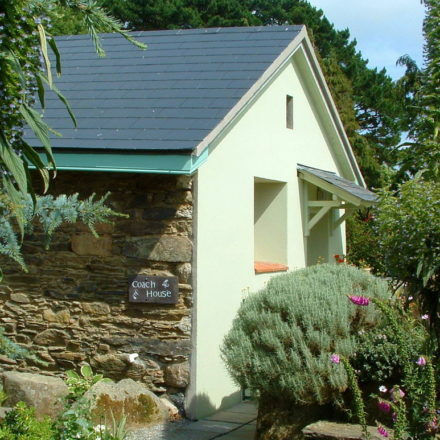 A one-bedroom house, the Coach House is perfect for a romantic getaway or a honeymoon! 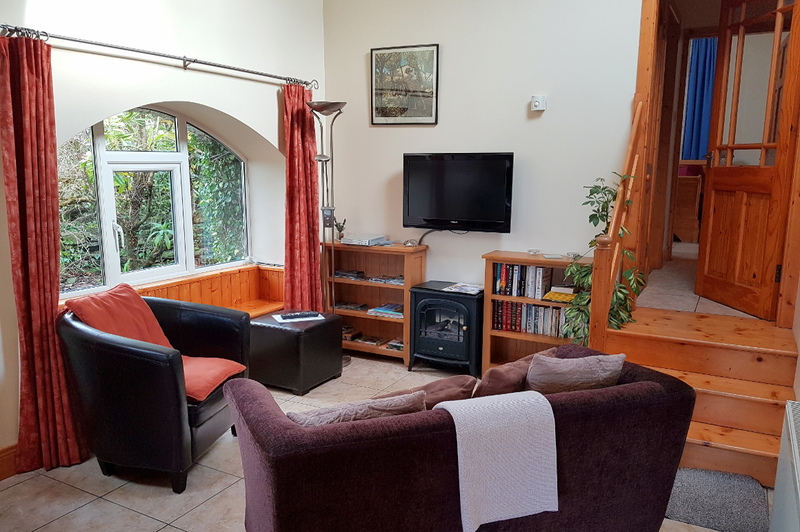 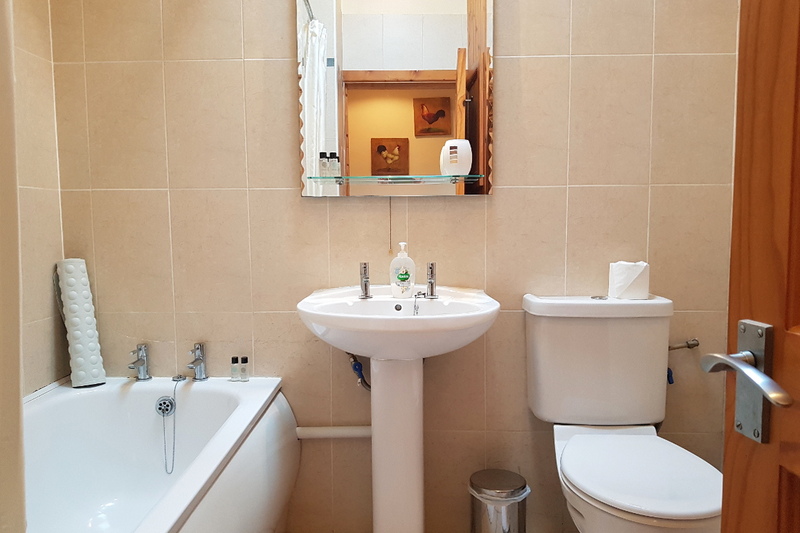 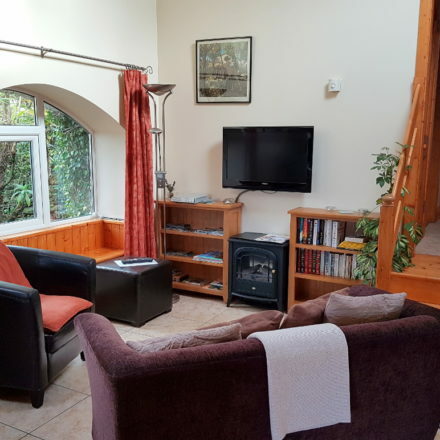 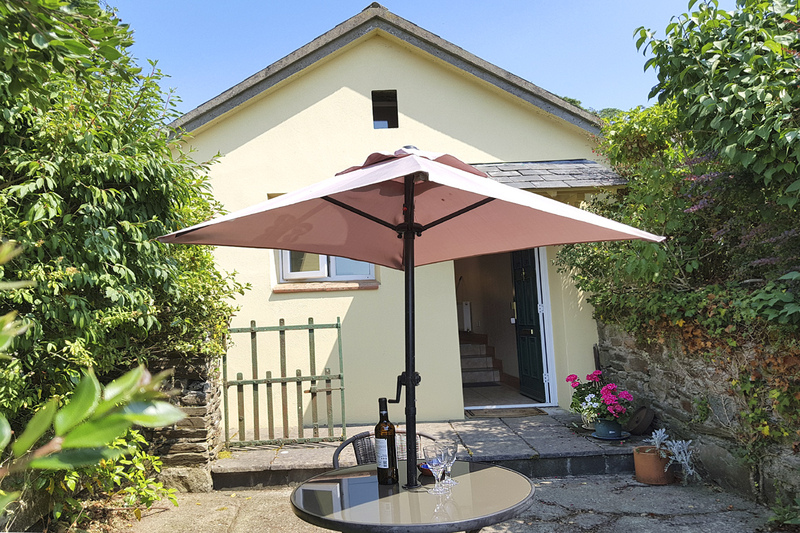 Coach House, a delightful self catering 1 bedroom cottage has a spacious open plan living area and roof windows in the high, beamed ceiling flood the room with light. 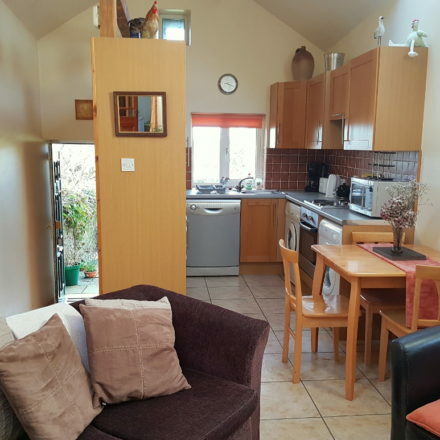 The living area has a well appointed galley kitchen, dining area and a comfortable lounge area. 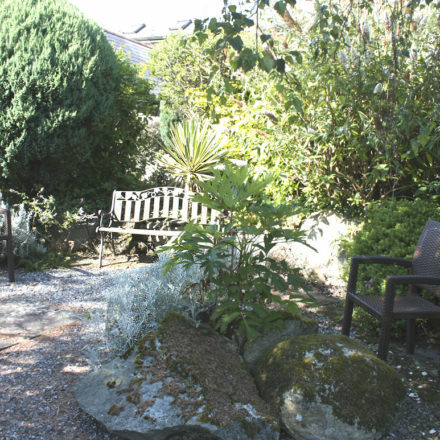 From the comfort of the couch or easy chair you can enjoy the pleasing vista through the large arched window in the lounge of the fragrant courtyard garden. 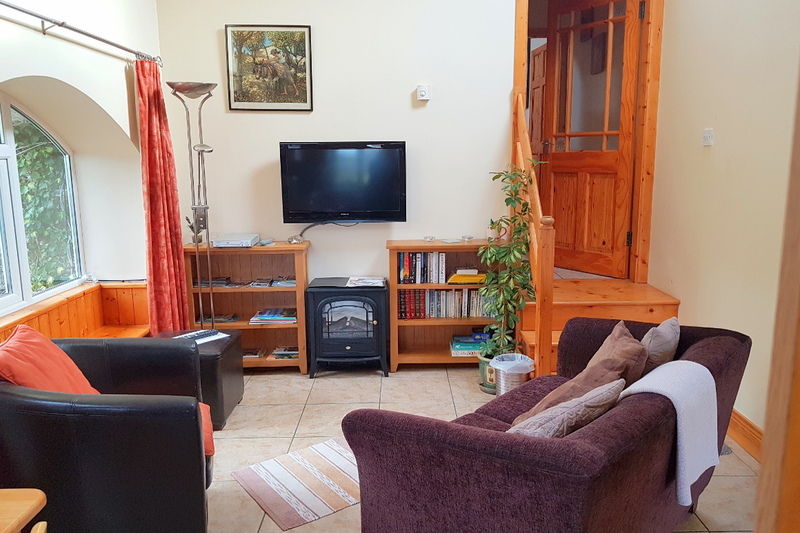 The electric ‘wood-burning’ stove in this room also adds to the atmosphere of this bright, cheerful, very restful room! 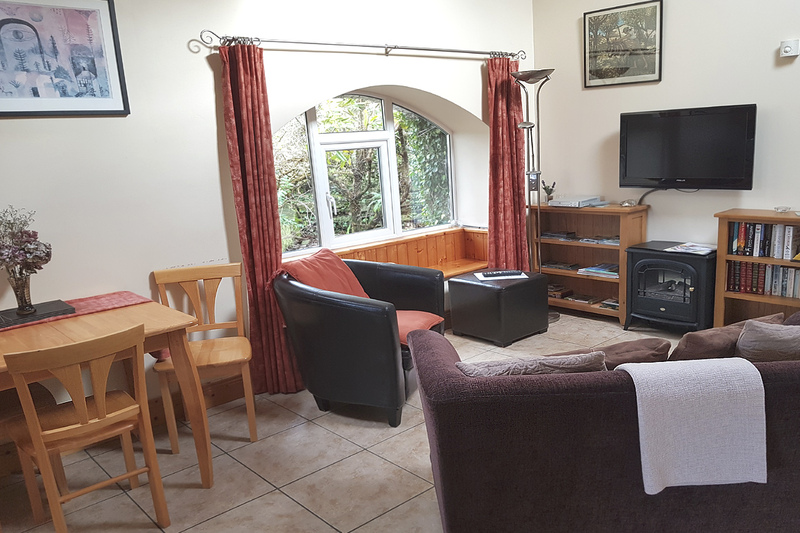 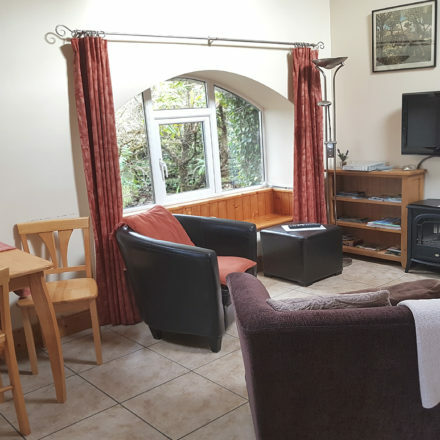 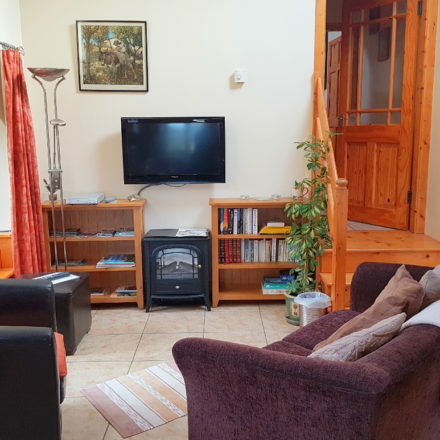 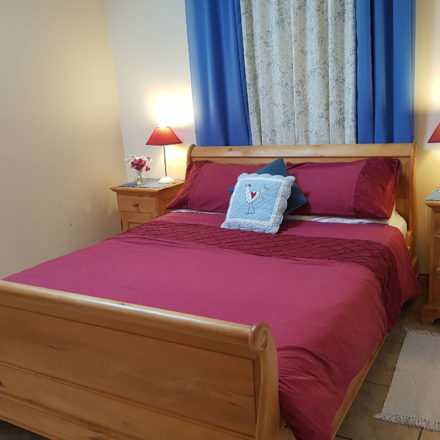 A wall-mounted large flat screen Satellite TV with Irish and English Channels and lots more, a DVD player, a radio/CD player and free unlimited access to Wi Fi. 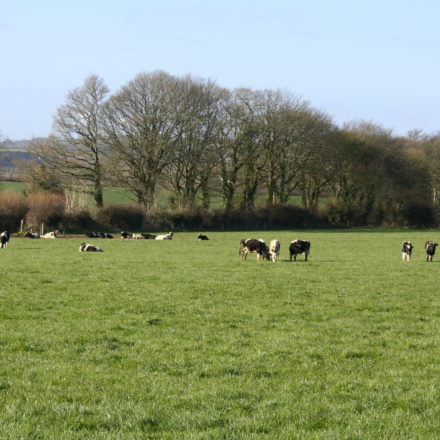 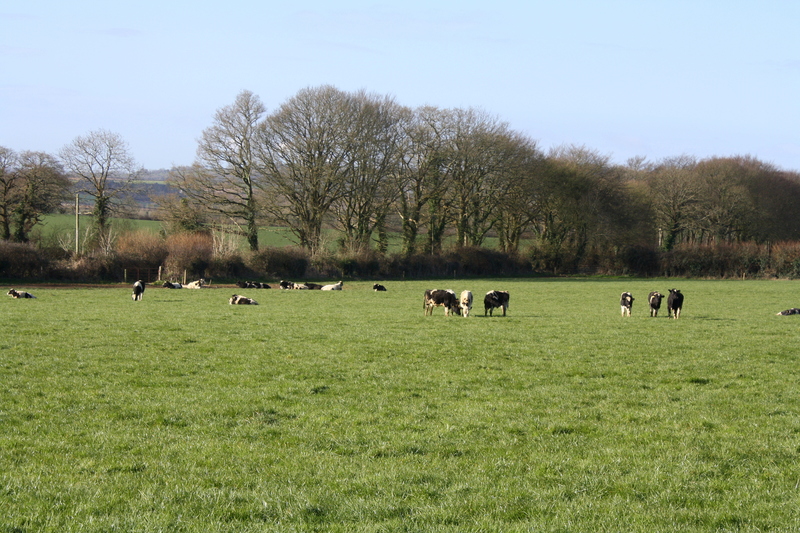 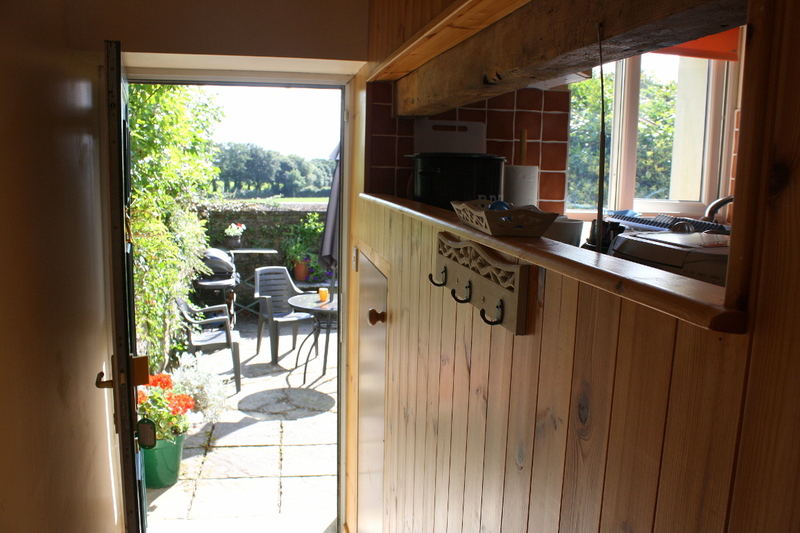 From the kitchen there are lovely views of the surrounding countryside and the sunny private patio. 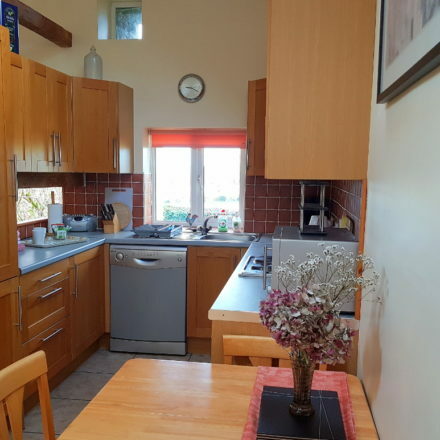 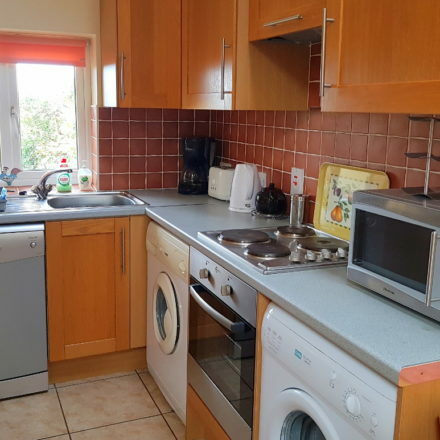 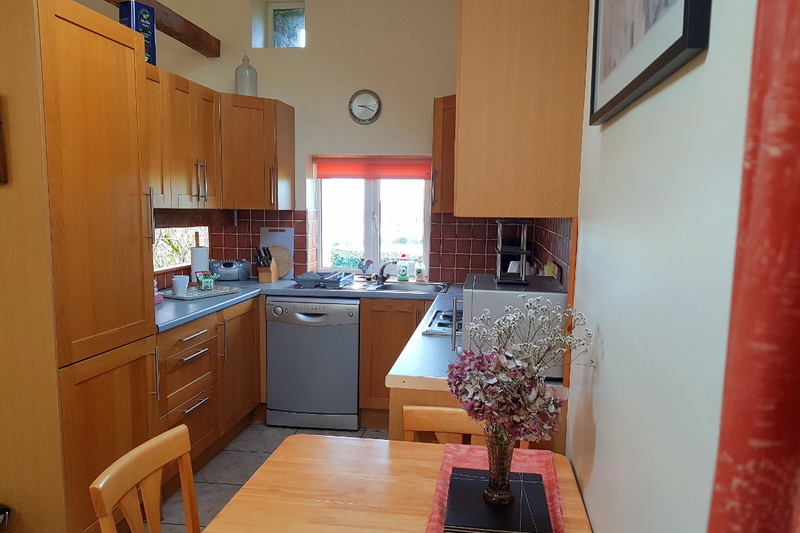 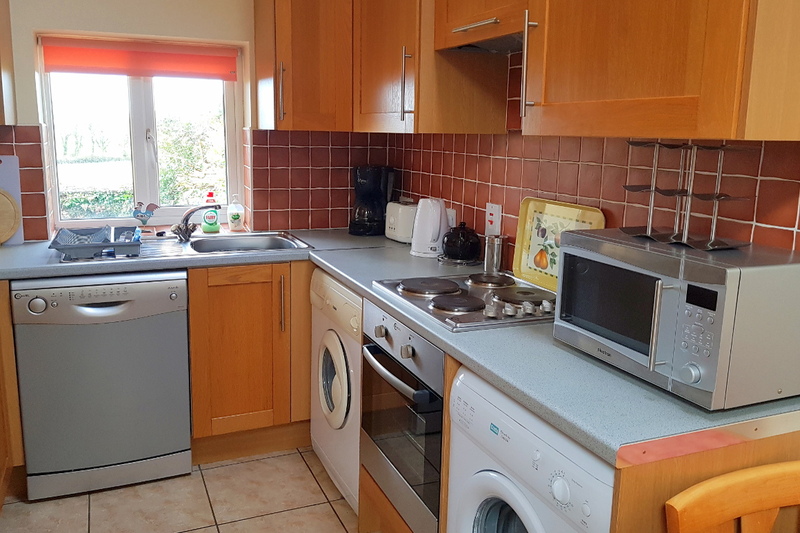 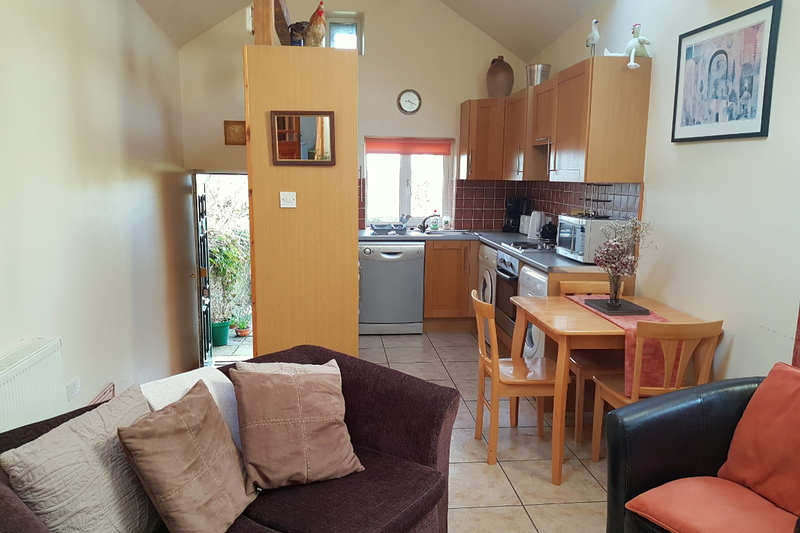 With lots of storage space, the kitchen has an electric hob & oven, microwave, large fridge/freezer, coffee-maker, toaster, electric kettle, dishwasher, washing machine, tumble dryer, iron, ironing board, CD/radio, and there is a stylish, extendable dining table with seating for four. 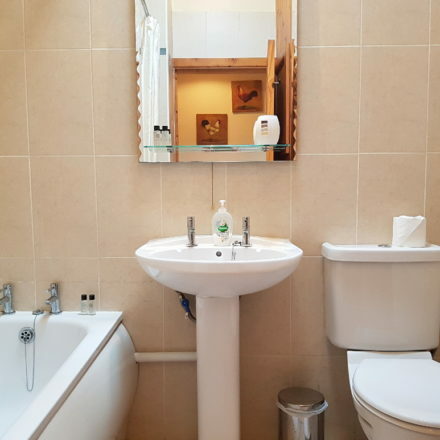 A traditional glass-panelled door at the top of a few steps in the living area leads to the bathroom, which has a bath/ shower, toilet and hand basin. 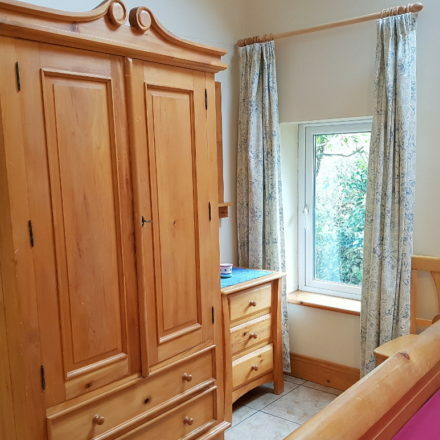 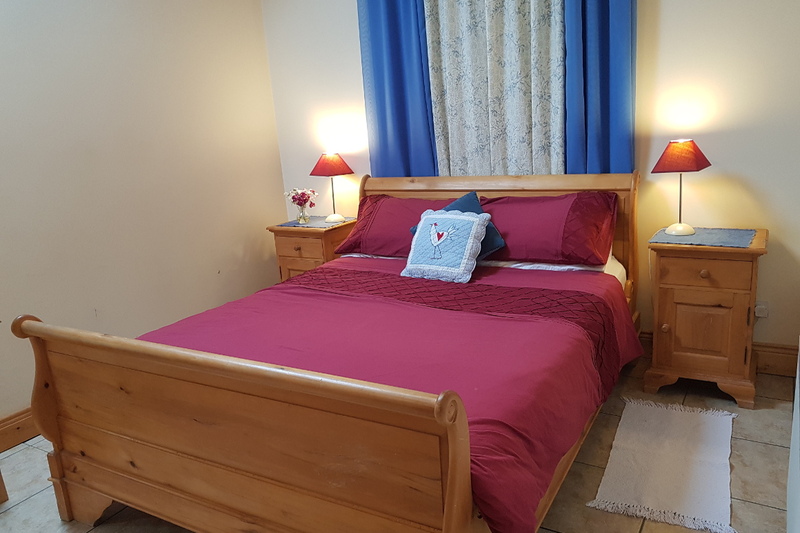 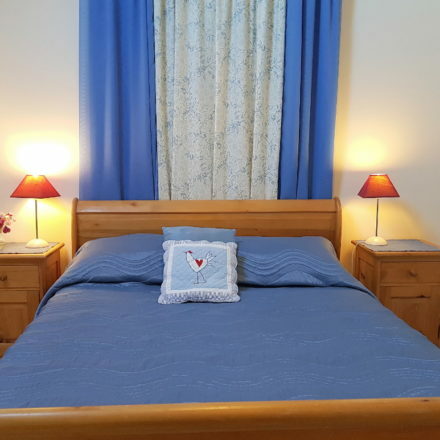 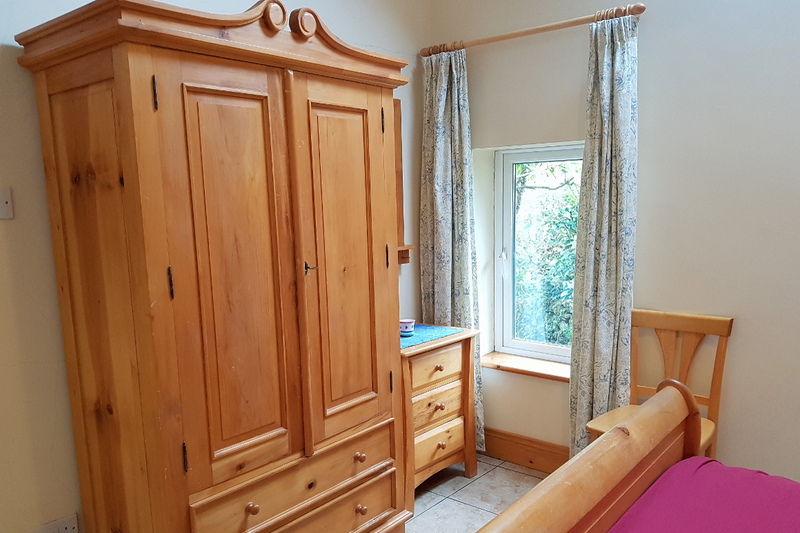 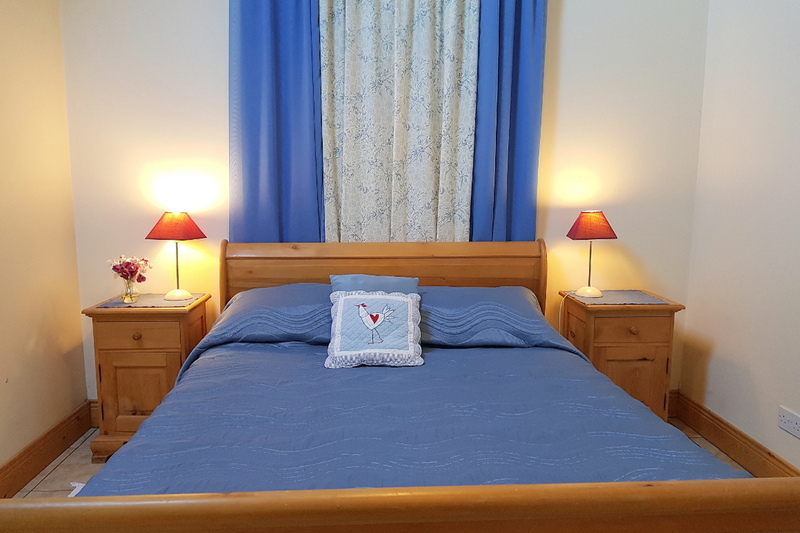 The bedroom, alongside the bathroom, has a large 5 ft sleigh bed with matching free-standing furniture and delightful views of the garden and attractive draping behind the headboard completes the fairytale image! 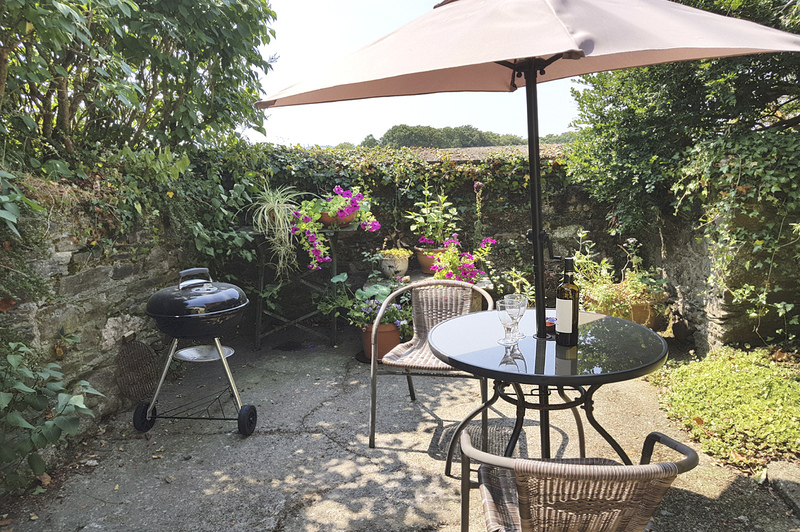 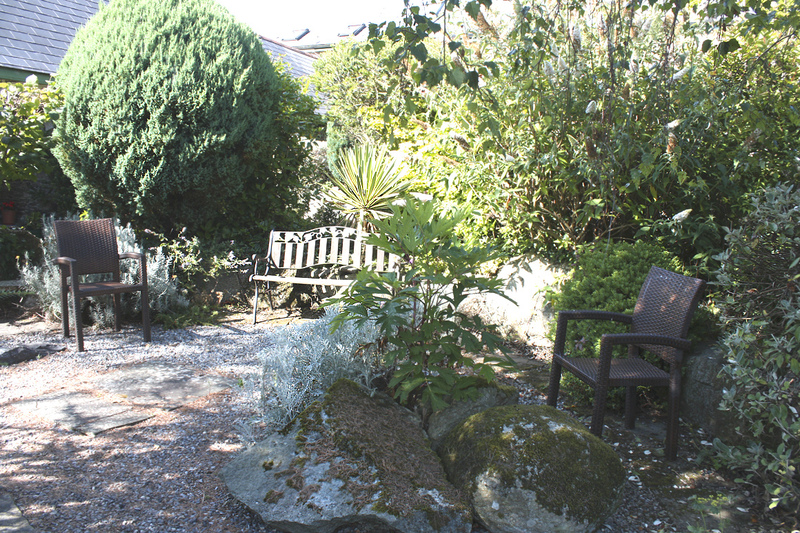 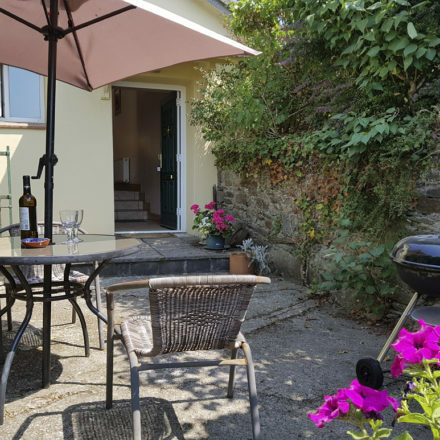 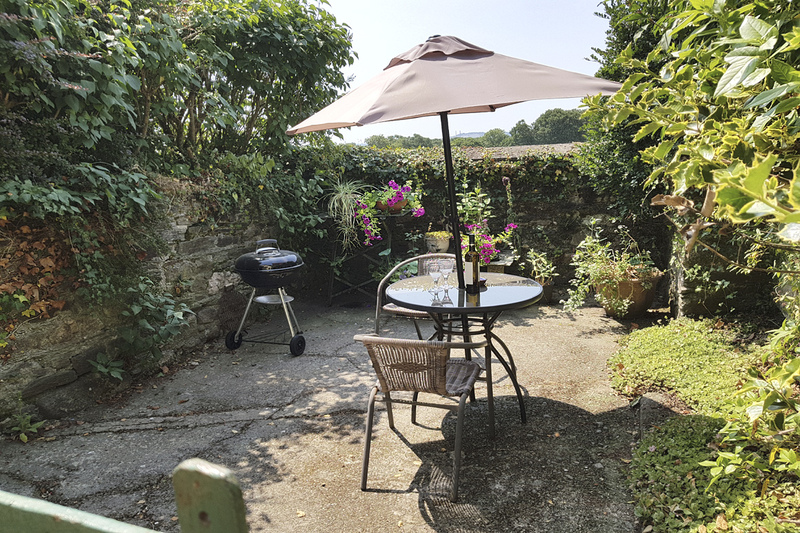 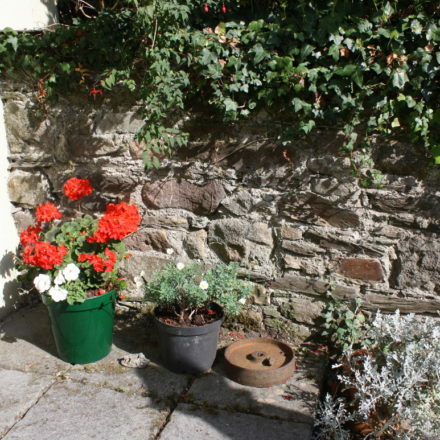 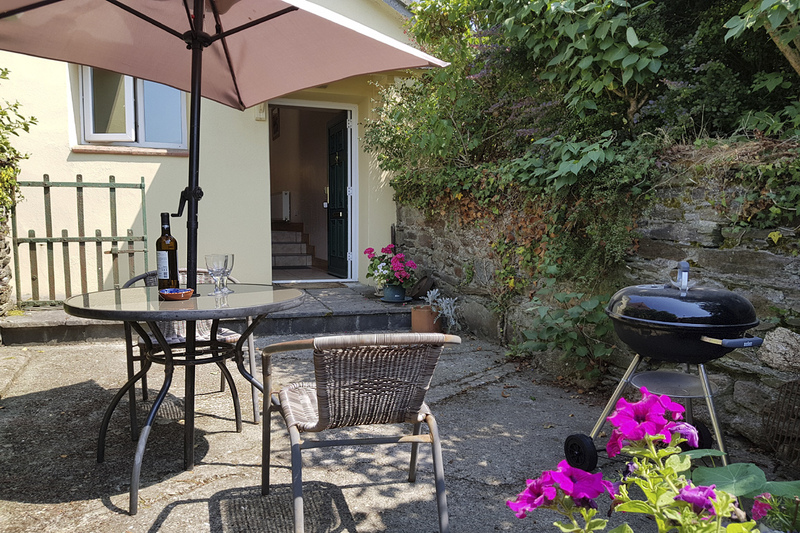 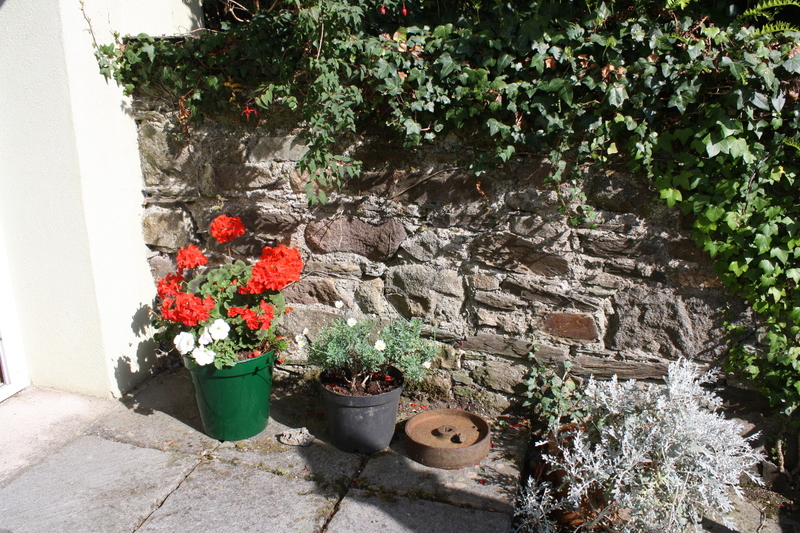 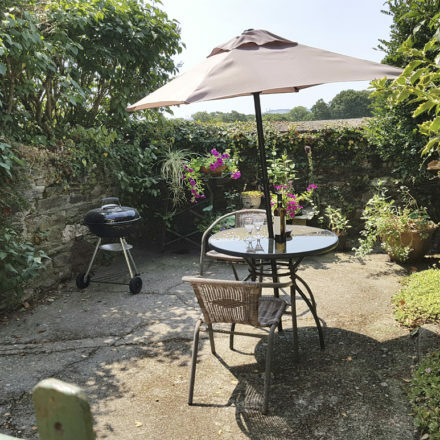 Coach House is a hidden gem of a self catering 1 bedroom cottage which has its own charming, private patio with table & chairs and BBQ, bordered by traditional stone walls and fragrant shrubs, a gorgeous suntrap to enjoy some well-deserved R & R!